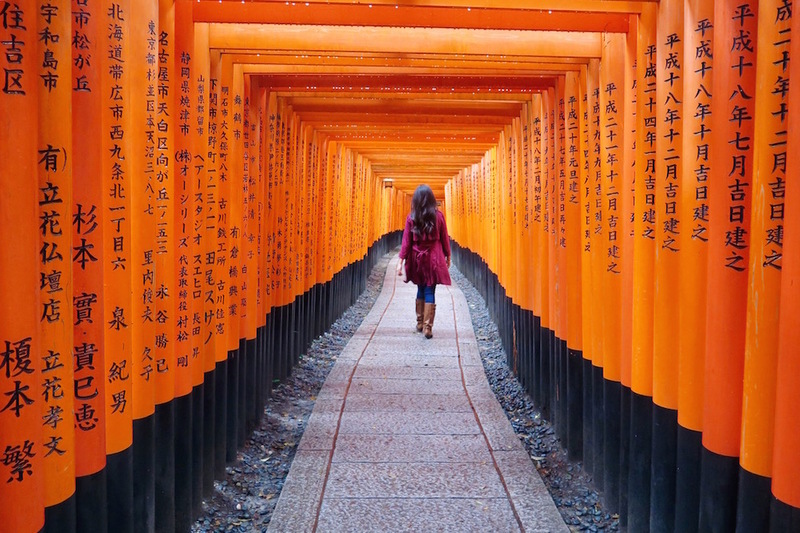 A popular tourist spot in Kyoto, Fushimi Inari Shrine is one of the most beautiful and peaceful areas you’ll find in Japan. 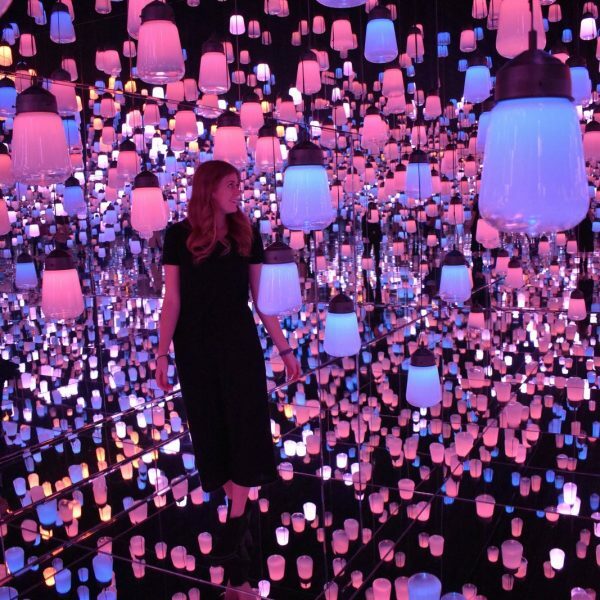 Composed with thousands of shrines, this popular location attracts visitors and photographers for it’s illusional, maze-like effect the shrines create when walking through it’s path. 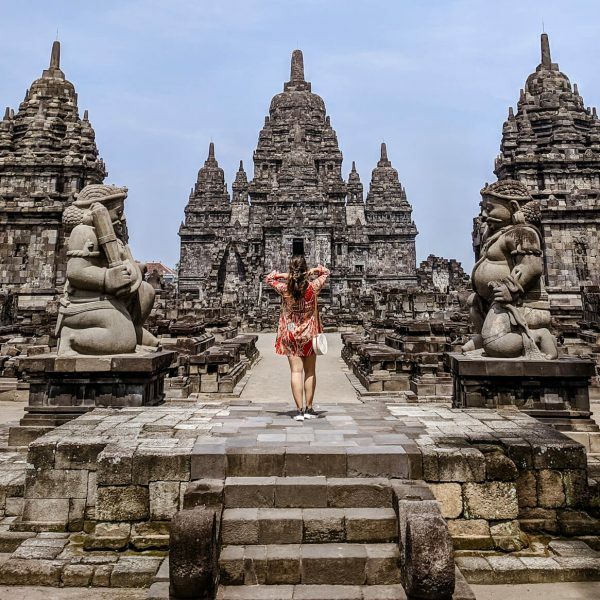 However, you may find it difficult to enjoy the calmness or capture a good photo if you’re constantly fighting the way through tons of tourists. 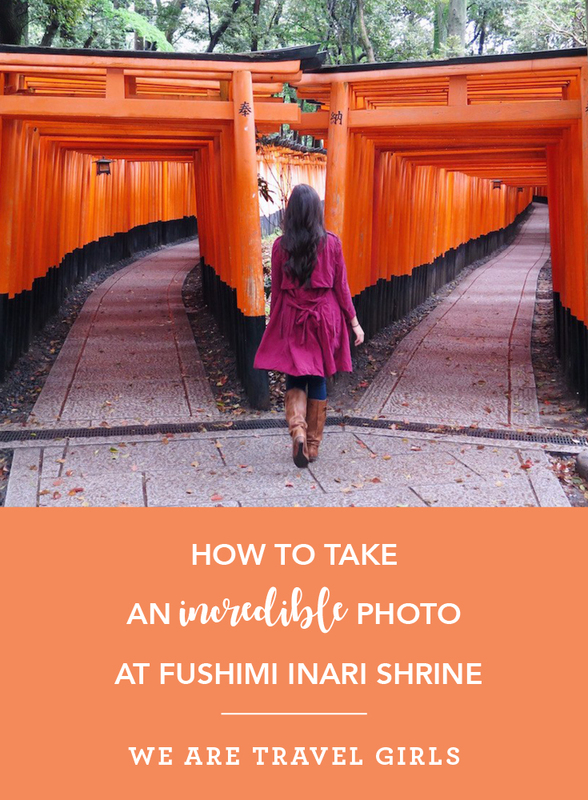 Save your sanity and photography by making the effort to try these four tips to achieve an excellent photo at Fushimi Inari Shrine. Fushimi Inari Shrine is an extremely popular spot for tourists in Kyoto. To capture a photo without any persons in your way, arrive at the shrine around 6:00-6:30 AM. Check for when the sun rises that day and it’s best to plan to leave your hotel or accommodation 40 minutes prior if you’re taking the train, and 30 minutes prior if you’re taking a taxi. Once you arrive, you’ll enter first through the site’s temple. Follow the signs uphill to the shrine where you’ll (hopefully) have the entire place to yourself. *Just remember: You’ve arrived early to have the entire shrine alone, or almost alone. Photos shouldn’t take up your entire experience. Let go of the camera and listen to the calmness of the shrine in the morning and remember that a photo can never capture the moment your in. Don’t take your time at the shrine for granted. The sun is still rising by the time you’ve arrived at the shrine, if you plan to arrive before the crowds. 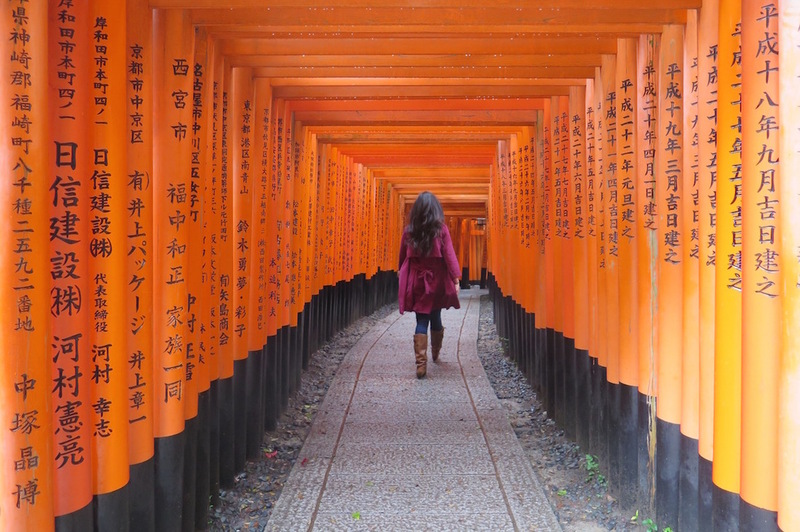 An easy tip to capture the beauty of Fushimi Inari Shrine is to take a few steps inside of the shrine before capturing your photo. I’m not a professional photographer, so please correct me if my vocabulary is incorrect, but by standing inside of the shrine to take your shot as opposed to standing outside helps eliminate any uneven lighting in your photo. The contrast is more balanced, lighting more even, and colors of the shrine are more vibrant. When you arrive at the shrine, you’re greeted with two paths. A sign indicates that one is for entering and the other for exiting. You may spend some time capturing photos at the entrance as you think that this is your best bet to capture the perfect tourist-free photo. Like myself, you are very wrong. The entrance is stunning, yes, but it is much more beautiful on the other side of the exit to capture the shrines. Walk through the entrance way and when you get to the end of the shrine and are faced with two paths again, take some photos of the exit path heading in the direction which you came from. The reason why I prefer this angle so much more than the angle of the entrance way is the facing alignment of the shrines. From the entrance way, you actually see the shrines from the back. From the exit way, you see the shrines from the front, exposing all of the beautiful writings and blessings on each shrine to be captured beautifully in a photo. Some may prefer the entrance and would like a cleaner shot. 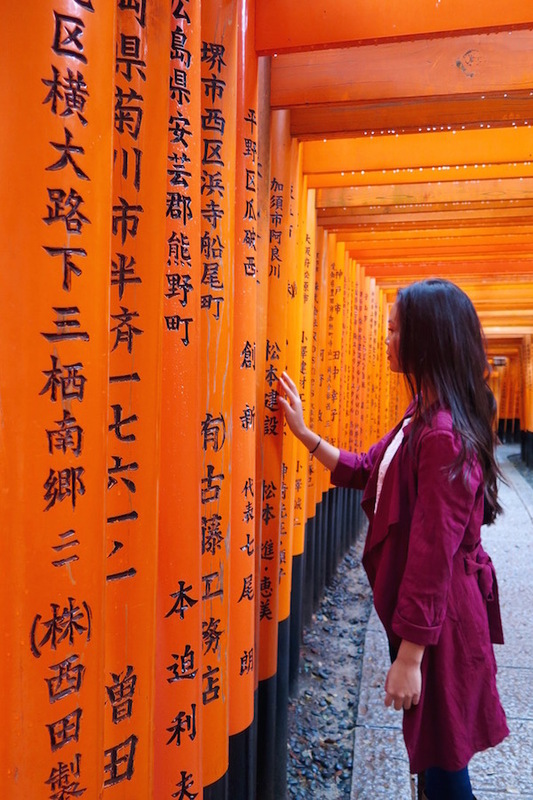 However, I prefer every detail of Fushimi Inari Shrine, as the messages written on each shrine is dedicated to the history and significance of the person is is meant for. I know everyone is different, so you’re welcomed to choose which shot you prefer. You have the entire shrine to yourself, you’ve spent a nice chunk of time capturing photos from all angles, now it’s time to leave before the tourists arrive? No, I don’t think so. 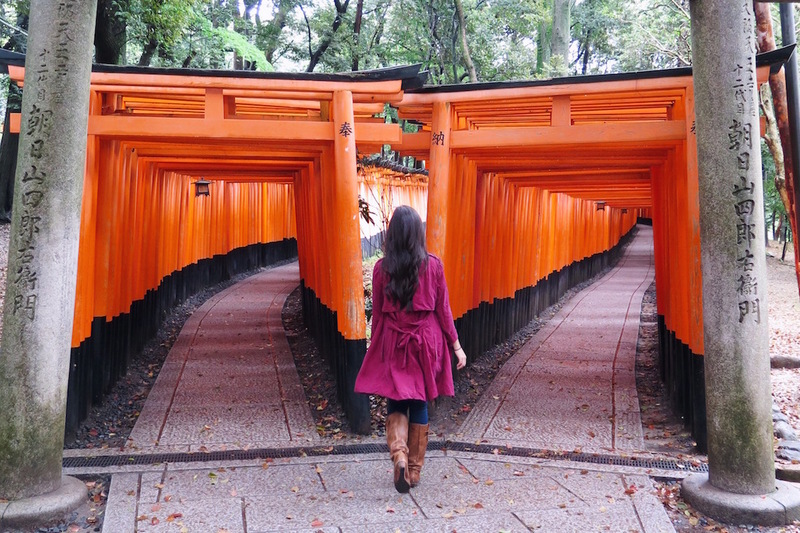 A lot of people assume that Fushimi Inari Shrine is just that one double-strip of walkway. 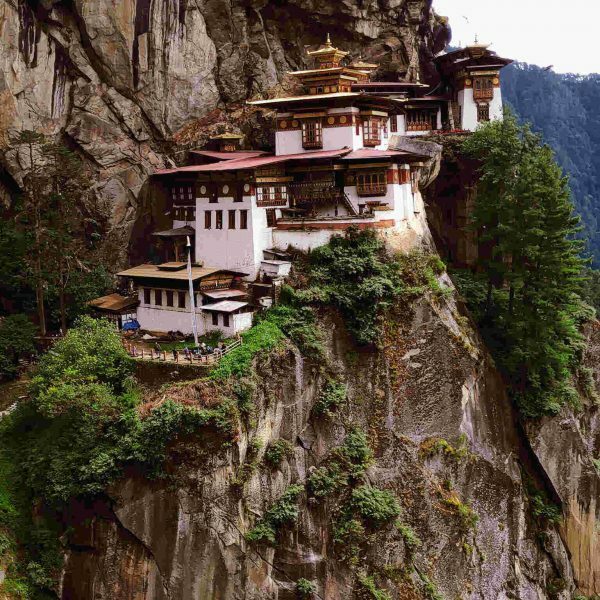 However, the shrine is actually composed of thousands of shrines placed eloquently along the mountain in which many locals and tourists can hike through. The entire hike back-and-forth takes about 2-3 hours. I’m not suggesting that you go the entire way, I’m simply adding that if you believe that the only snippet of photography you can achieve is the intro to a very beautiful path of shrines, think again my friend. Take a 5-10 minute stroll along the longer path of shrines to enjoy the moment of peace in the morning and take a few more captures. If you get tired or would like to move on at any moment, please do so and turn back around! You’ll be glad you went and disappointed if you don’t. 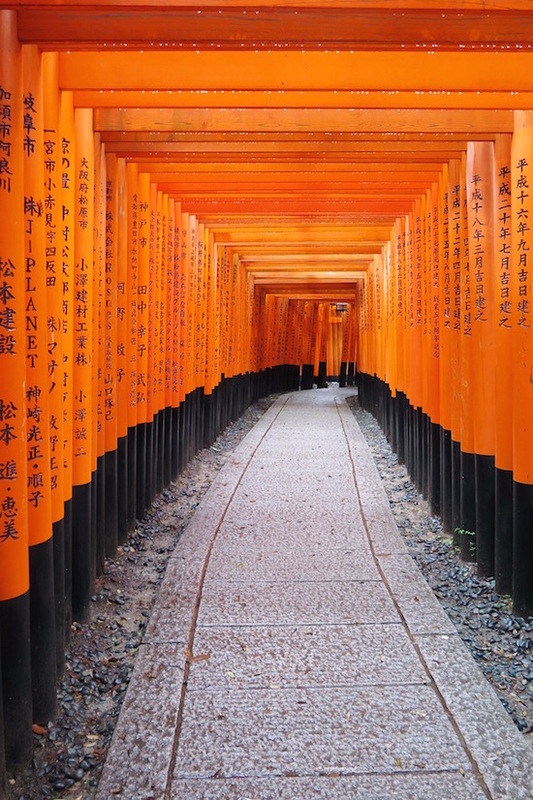 We hope that this article has inspired you to visit Fushimi Inari Shrine. If you have any questions about Japan or advice for our readers please leave these in the comments below. Well, I wish I had seen this post BEFORE I went. Very useful.